I'm struggling to work out exactly who Nintendo Labo VR is for. On the one hand, Nintendo has very carefully made sure that it's playable by users aged seven and up, but also priced it at a point that only adults will be able to afford it. It's a confusing proposition, and one that gets even more complex after actually getting to play with it. If you're wondering exactly why the Labo VR kit is so child-friendly, it's because it doesn't come with a head strap. That means if young ones - or older ones - start to feel nauseous, or uncomfortable, you're not trapped inside the headset: you just have to drop the VR visor down from your eyes, and hopefully not drop it with your Switch stowed inside. It's an interesting choice, as it does let more of the family get involved with VR fun, but can make the entire experience a little tiring. After all, you've got to manually hold the VR goggles, other cardboard Labo creations, and your Switch, to your face the entire time you're using it. Obviously though, Nintendo has thought of a solution for that - creating games that are intended for short bursts of play. 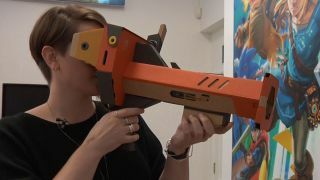 During my preview session, I got to go hands-on (and face on) with all the Labo VR creations, but was only able to play the associated games for two of the kits - the Goggles and the Blaster. There are actually six Labo VR kits in total, which range from a bird-flying simulator complete with flapping bird Labo to a wind pedal that genuinely wafts air in your face as you press it, and will have you leaping through the air in an almost Doodle Jump-like game. The Blaster gets you an on-rails shooter game where aliens have invaded Earth and it's up to you to take them down. Using the real-life Blaster - which has a satisfying reloading action that involves a motion not dissimilar to cocking a shotgun, and a punchy trigger hidden in the handle - you'll have to splat them into submission. It's much more Splatoon in terms of tone than any kind of true Nintendo FPS, but it's surprisingly satisfying. There are levels to work through, and high scores to achieve, so it's got plenty of replayability, and an element of competition to it. Nabbing yourself the Blaster also gets you a hippo-themed multiplayer game, which was my favourite activity of the day. It involves firing fruit into the mouths of cute hippos in a pond, and if you're successful, they'll swim towards you and push any other hippos in their path towards your winner's circle too. It's basically shuffleboard, but with fruit-loving hippos in VR. You pass the VR headset and the Blaster attachment between you and a friend to see who ends up with the highest score. It's adorable, simple to grasp and rather good fun. But it's all very short-lived fun, which you'll need really as holding the Blaster up to your face for long periods of time isn't going to that enjoyable, despite the clear efforts made to make the design of the various kits as ergonomic as possible. You appreciate how heavy a Switch is when you're holding it like that, let me tell you. Thankfully, you're not just limited to the handful of games you'll get with the kits themselves. There are actually 64 minigames and experiences to dive through, and while not all of them are games, they're all made using the internal Labo Garage coding software, so they give you a taste of what you could actually make. My particular favourite involves using an added extra from the Labo VR Starter Kit, which is a little windmill that hangs down below the Goggles, so you can turn the wheels just by blowing it. You literally blow for as long as you can in one go to knock toys of a shelving unit with a kind of beanbag-loaded machine gun. Again, it's simple but effective, and indicative of how easy it could be to make your own VR games. However, it's odd that Nintendo has hidden away the enhanced Garage coding tech within Labo VR. It's more focused on teaching kids to make games rather than tinker with Toy-Con adaptations, which feels like a seriously cool bit of kit that's going to be lost. You can make real games with it, and not just VR games, so it feels strange to lock this amazing tech behind owning the Labo VR software cartridge, seeing as you don't need the Labo kits to make all the games. They almost come as an added benefit to an already awesome piece of software. It's also odd that you can't share the games you've made in Labo Garage VR either. Apparently it's to protect your kids from people's potentially weird creations, but even offering a code trading option seems like a good option. Confusing, right? At this stage, what I've seen of Labo VR feels like virtual reality for beginners. Aside from the joy of building each of the Labo VR kits, and understanding exactly how they all work, it doesn't yet feel like there's anything distinctly Nintendo about this new virtual reality experience that could really distinguish it from the competition yet. Don't expect to see Super Mario himself anywhere near Labo VR - or, at least, not yet. Nintendo's already proved that it can make Labo products compatible with other games in its library with the Vehicle Kit and Super Mario Kart 8 Deluxe, so the potential is there. It might just be a case of binding your time before Labo VR has something really unique to offer. I'm left wondering who it's aimed at. Yes, it's great for kids, and actually a little more social than other VR kits, but with quite a high price point it's going to be for a very niche audience, even taking the large Switch user base into consideration. Just the Starter Kit alone (which gets you the Goggles and the Blaster) costs £34.99 / $39.99, or you can pay £69.99 / $79.99 for the full Labo VR kit, which comes with all six kits. For now, I'd advise waiting until Nintendo Labo VR has something to offer that really makes it stand apart from the virtual reality crowd. Read more: Can Labo VR hits the sweet spot between Google Cardboard and Oculus VR? It doesn't look like it yet.